Earlier I wrote about a member of the Idaho legislator and livestock rancher, Monty Pearce, who has recently taken aim at bighorn sheep conservation and restoration efforts in response to a sheepman’s call for special treatment from the Idaho legislature. This after the Payette National Forest’s proposal to drastically reduce his permitted domestic sheep grazing on your federal public land. Rancher Pearce’s legislation, Idaho Senate Bill 1124, seeks to bring to a halt the Idaho Department of Fish & Game’s efforts to transplant and relocate bighorn sheep – and potentially most big game – in the state of Idaho. Ironically, the Idaho Attorney General’s Office answered some legal questions that suggest Idaho Senate Bill 1124 might be just as likely to backfire, removing a federal obligation the Forest currently has to consult with the state over wildlife issues. Requires an agreement between the feds, the state, and any private persons before transplant or relocation of bighorns. Removes decision-making authority concerning transplant from the Idaho Department of Fish & Game and requires transplant and relocations of bighorns to be approved by local boards of county commissioners (usually heavily loaded with the ‘Usual Suspects’ of ranchers). Requires state wildlife managers to relocate bighorns when they come into close proximity of domestic sheep and gives ranchers the right to demand relocation of bighorn. Requires testing of “any” communicable disease before transportation and importation of deer, elk, antelope, moose, bighorn, and bison. Given the far reaching implications of Monty Pearce’s proposed legislation, State Senator Jon Thorson of Sun Valley requested that the Office of the Attorney General of Idaho review Senate Bill 1124. The response to the state Senators’ legal questions sheds some light on the bill. The ‘complete power’ that Congress has over public lands necessarily includes the power to regulate and protect the wildlife living there. As mentioned before, state wildlife-managers and Livestock interests have been known to beat their chests and bellow, ‘the feds own the land, the state owns the wildlife‘. This suggestion has been a premise behind the state’s interim-policy establishing “extermination zones” around domestic sheep allotments on public lands, a policy developed in back rooms and under the thumb of the Woolgrowers, with a “collaborative working-group” invitation for public involvement as window-dressing. However, state supremacy with regard to wildlife management on federal public lands is a myth. It is true that states have authority to manage wildlife in most instances, but only because of the absence of federal action. This fact led the Attorney General’s Office to note that the bill doesn’t prevent the federal transplant and relocation of bighorn nor prevent the Forest’s legal obligation to reduce, if-not eliminate, domestic sheep use on public land to maintain wild-sheep viability. 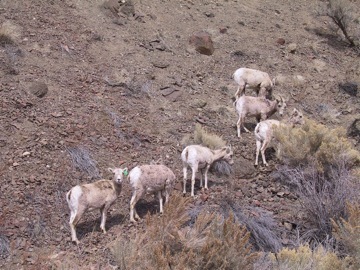 The devolvement of final decision-making authority to county officials for transplantation or relocation of bighorn sheep, however, could be interpreted by federal authorities as relieving them of the obligation to cooperate in decisions relating to the transplantation or relocation of bighorn sheep. […] While federal statues (sic) and regulations require federal agencies to cooperate with state agencies and officials in regard to wildlife management, […] there are no similar requirements requiring cooperation with county officials. Thus, devolving authority over bighorn sheep management to county commissions could actually result in an increased federal role in bighorn sheep management. The last provision requiring deer, elk, antelope, moose, bighorn sheep, and bison to be tested for “all” communicable disease that can be transmitted to domestic livestock, if enforced, would grind to a halt transplantation and introduction of these big game animals, at least at the state level, necessitating federal involvement if species viability is brought into question. The provision appears to be an attempt from the ‘pot to call the kettle black’, spinning the issue on its head by vilifying wildlife, an that Livestock politicians and ranchers are happy to oblige. The issue is not about some speculation brought out-of-thin air about whether wildlife are infecting domestic livestock – it’s about the conclusive scientific understanding that domestic sheep spread deadly disease to wildlife – and, if truth be told, domestic sheep on public lands spread prehaps the most infectious communicable disease to humans too, they are a threat to human health (See: Q-Fever, Valley Fever,etc.). If state senator Monty Pearce wants to use his position in the Idaho statehouse as a platform to punish bighorn advocates and Idaho sportsmen for the Forest Service’s recognition that domestic sheep use is a direct threat to bighorn viability, perhaps it’s time bighorn advocates and Idaho sportsmen readied to work with the federal government rather than the state and its politicized Idaho Department of Fish and Game, whose limp-noodle stewardship of Idaho’s wildlife heritage has become wholly co-opted by the pressure of agricultural interests in the state. For a recap on the bighorn sheep issue in Idaho – check our previous posts. Word on the street is that there is yet another bill which will appear tomorrow. No word on what the number is yet or what the bill says.